Last night, I completed a playthrough of The Order: 1886 on Kotaku’s Twitch channel. When the PlayStation 4 game released in 2015, the critical response, including our review, was less than kind. But I’ve found that playing it a few years later reveals a game that, while certainly flawed, offers an intriguing, believable, and well-crafted world that I’d like to spend more time in—unlikely as that is. The Order: 1886 takes place in an alternate history in which King Arthur existed and his knights battled against “half-breed” vampires and werewolves for centuries thanks to the discovery of “Blackwater” a magical potion that expands lifespans. The titular Order is a mixture of long lived knights and new recruits, all bearing the name of their forefathers from the Round Table, who continue to battle the half breeds. The player controls Sir Galahad, a respected Order member who gets caught up in a conspiracy between the half-breeds and anti-government forces. Reading reviews from the time of release, the overwhelming sentiment seems to be that The Order: 1886 never does enough to break from pre-established gameplay routines. Game Informer’s Matt Miller said that he felt that he was playing “a long- established template for third-person shooting mechanics,” while Polygon’s Justin McElroy observed that “you’ve seen every single one of The Order: 1886's tricks performed better elsewhere.” But what I see is a game with a confident sense of presentation that doesn’t feel the need to chase after innovation and novelty for their own sake. Miller and McElroy do have a point. The Order: 1886 plays by a very specific formula of corridor shooting sequences connected by lengthy cutscenes. But the game’s production value elevates this formula into something more than the sum of its parts. Galahad moves with a well-defined gait in casual moments, with a sort of half-invincible swagger that feels like the walk of a man who has lived for centuries. When the shooting starts, it breaks into something more focused and fierce, granting players a liberal amount of control while moving and shooting. Even if you’ve seen every one of the The Order’s tricks in other games before, it’s unlikely you’ve ever seen them look this good or feel this genuine even today. There is a weight to everything in The Order, from Galahad’s steps to the guns he hefts to the scraps of readable paper he finds throughout levels. When you charge up your lighting gun, there is a vibrant thrumming that precedes its release. When you pass a woman on the street, the light reflects perfectly off her dress. Perhaps other games have faster-paced gunfights or more satisfying enemy variety but The Order is one of the very few I’ve encountered that truly delivered a world. That world’s realness is most notable in the unlikeliest of places. During a tense gun battle on a bridge, I unloaded my machine gun on an armored shotgunner pressing towards my position of cover. When I ejected the drum on my weapon, it launched out with a chunky pop, landing directly on top of the box I was hiding behind. The shotgunner fired, a gout of smoke and sparks narrowly missing me, and out of reflex I backpedaled from cover and fired on the move. Galahad’s animation was so seamless that stopped what I was doing to experiment with the controls to make it happen again. I can’t begin to think of the last time I’d encountered a moment that felt so right during gameplay. Where The Order genuinely falters is limiting how much players can meaningfully interact with the world around them. The player is grounded in a space that feels real, but never develops a connection to the people inside of it. Throughout the game, Galahad fights side by side with numerous comrade in his order from the determined Lady Igraine to an alternate history Marquis de Lafayette but there’s very little cooperative action with these NPC comrades. 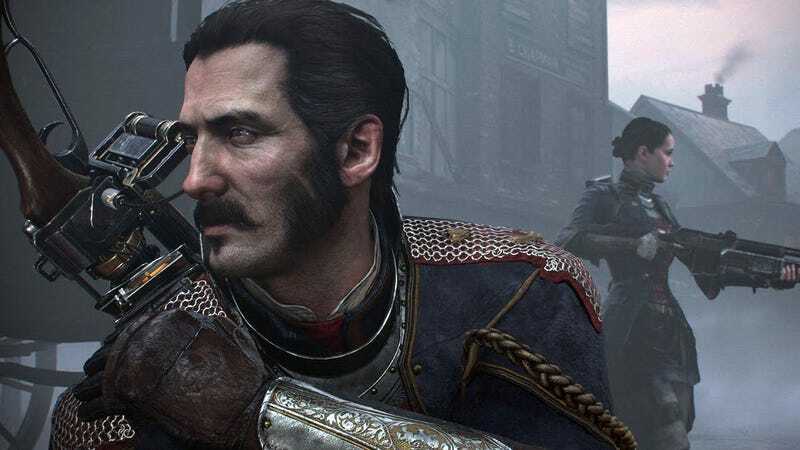 The Order: 1886 places Galahad side by side with plenty of comrades crucial to the plot but never finds time for well-considered interactions that help players understand the shifting loyalties and dynamics within the Order. The Last of Us, released two years prior, uses cooperative moments to help express the growing bond of trust between Ellie and Joel. Initially, Joel solves all puzzles himself before slowly working with Ellie. One major action he often performs is boosting Ellie to higher platforms. After a selfish decision at the end of the game, that action changes; he climbs a ledge first before helping her up. The Order: 1886 focuses on QTE stealth executions and melee battles against werewolves, leaving all character bonding and personal moments to cutscenes. These cutscenes feature strong acting and clever editing to set a mood, but the intrigue and emotion never quite follows into the gameplay itself. As a result, while each new location feels like a wonder, the characters and their motivations stand out less. This comes back to haunt the game during its rushed finale. After discovering a member of the Order is a werewolf working alongside an evil vampire, Galahad is framed for an assassination attempt and forced to flee from his comrade. The entire affair culminates in a bloody knife fight that sets up the game’s final moment: Having bested the Order’s traitor, Galahad is told by the Order’s Lord Chancellor that the treachery can never be revealed to the rest of the world. The idea of a werewolf infiltrating the Order would shake people to the core. Instead, he is given back his gun and, with one final press of the trigger, executes the villain before fleeing into the night. The actors give great performances, and the final button prompt is framed perfectly, but because the game never truly let Galahad connect with his peers, it feels emotionally hollow. In spite of that, The Order: 1886 was onto something. It wasn’t trying to reinvent the wheel but rather make the best damn wheel it could. If The Order: 1886’s biggest sin is that it’s just another third-person shooter with quick time events, that is evened out by just how spectacular each moment is. It doesn’t stick the landing, but the journey is enthralling. Three years after its release, my playthrough has me pining after a sequel, and a chance to keep exploring what felt like one of the most well-defined worlds in video games.